1. The constancy of change in neighborhood populations. The canonical story of gentrification focuses on the fact that many of the people living in a neighborhood today are not the same ones who lived there a decade ago. The implication is that, absent gentrification, neighborhood populations change slowly, if at all. But careful longitudinal studies show that constant turnover in population is a regular feature of neighborhood dynamics, whether the neighborhood is gentrifying or not. 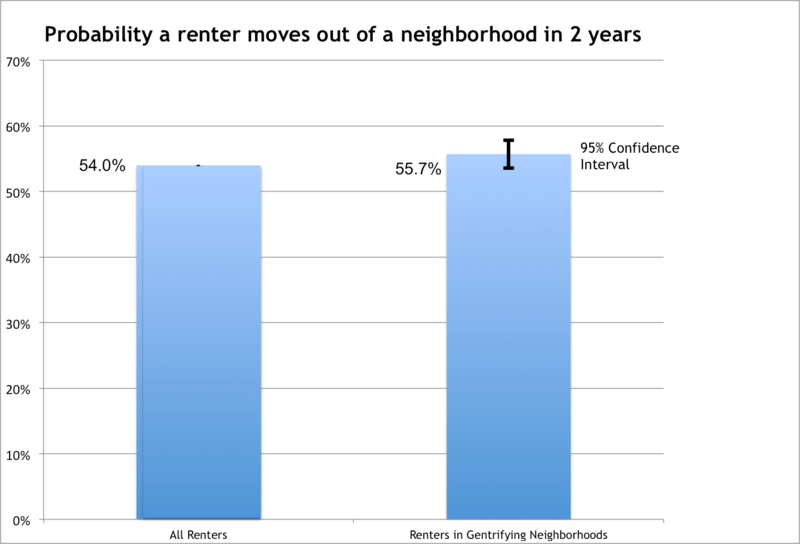 Half of all renters have moved in the last two years, and the rate of movement isn’t significantly affected by gentrification, according to a recent study. 2. Block that metaphor: “Naturally Occurring Affordable Housing.” There’s a new term of art that’s floating around the housing world: “NOAH” or naturally occurring affordable housing. It’s a catchall that’s used to describe privately owned housing that’s being rented at affordable price points, and is meant to differentiate this private market housing from public housing and housing getting Section 8 vouchers. In our view, calling affordable market housing “naturally occurring” conceals the important fact that it’s highly dependent on conscious local policy decisions, like zoning, parking requirements and permit review processes. Unless you live in a cave, your housing didn’t “occur naturally,” and whether its affordable depends directly on whether local land use controls allowed enough housing to get built to meet local demand. There is a real danger that calling market housing “naturally occurring” diverts policy attention from where it is most needed. 1. Policy tokenism: Arlington, Virginia’s ADU ordinance. We’re big fans of a range of “missing middle” housing policies, which aim to provide for a range of housing types beyond the usual dichotomy of single family homes vs. big apartment buildings. One of the ways to add density and affordability in predominantly single family neighborhoods is to liberalize the construction of accessory dwelling units (ADUs), also known as ‘Granny Flats.’ Greater Greater Washington reports that Arlington, Virginia adopted an ordinance allowing them in 2009, but in the time since, just 20 ADUs have been built, mostly because of the onerous requirements the city imposes: they must be owner-occupied, with deed restrictions limiting their use, and can’t be physically separate from an existing structure. Though well-intended, the ADU ordinance is falling well short of its potential to promote affordability and aging-in-place; it’s a reminder that solving our housing problems can only happen at scale. 2. Harlem’s Black Churches Cash in on Gentrification. DNAInfo reports that more than a dozen black churches in Harlem have sold out, literally, to developers in the past several years. Church leaders are faced with dwindling congregations and financially attractive offers from developers–who typically are looking to build market rate housing in place of houses of worship. The article notes that the churches were once better supported, but a combination of shifting demographics, and the growth of alternative outlets for black political activism has put them in a more tenuous situation. Local residents fear the loss of churches will accelerate the decline of the black community, and “Save Harlem Now” is organizing to explore policy options, like allowing the air rights above churches to be sold separately, as a way to tap the development value while retaining the churches. 3. The economic divide between big cities and smaller ones. An article by Eduardo Porter in The New York Times picks up a theme we’ve been emphasizing for the past two years at City Observatory. The nation’s largest cities and metro areas are powering economic growth, as smaller cities and metro areas lag. Porter’s article notes that private employment grew almost twice as fast in large metropolitan areas as it did in small ones from the trough of the recession in 2009, to 2015. The key reasons are well known to City Observatory readers: talented workers are increasingly concentrated in larger cities, and as a result, these cities are more productive and innovative. 4. America’s housing subsidies are skewed to the rich. 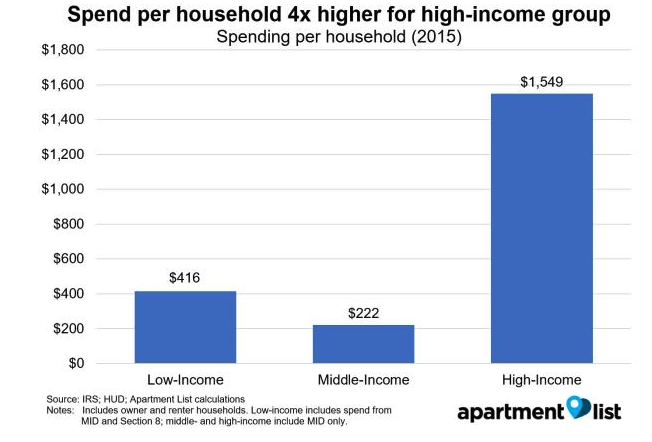 It’s not new news, but Apartment List has a graphic analysis of how lavishly the federal government subsidizes housing for high income Americans as compared to those with the lowest incomes. The mortgage interest deduction flows overwhelmingly to the highest income households; while only about 1 in 5 eligible low income households benefit from Section 8 housing vouchers. The net result: the federal government spends about three and a half times as much per household subsidizing well off households as poor ones. Who uses ride-hailing services and why. A new study from Regina Klewlow and Gouri Shankar Mishra of the University of California, Davis, reports the results of a survey of Americans about their use of ride hailing services. Overall, only about 21 percent of Americans in large cities have signed up for these services, although another 9 percent have ridden in rides hailed by others. Use of ride-hailing skews towards the higher income, young, the well-educated, and the urban: You are about three times as likely to use ride-hailing if you’re under 30 as opposed to 50 to 64; about twice as likely if your income is over $150,000 rather than under $35,000, likewise if you have a BA as opposed to just a high school degree, and the same margin holds if you live in a city, rather than a suburb. And interestingly, according to this study, Uber is all about eating, drinking and partying: some 62 percent ride-hailing users say their trips are to restaurants, bars or parties. Little surprise that 33 percent of users report that they use ride-hailing to avoid driving while under the influence of alcohol. Finally, the most commonly cited reason for using ride hailing is to avoid the expense and hassle of parking. In an article looking at the multi-city competition to land Amazon’s “HQ2,” Business Insider quoted Joe Cortright’s observation that it’s likely that Amazon has already selected its top prospects and is using the very public contest to strengthen its bargaining position.